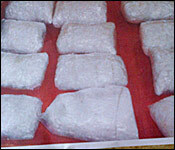 Tonight the Anti Drug Unit is proudly claiming the biggest bust of the drug Crystal Meth ever in Belize. "Meth" as it is called is short for methamphetamine - and it is a highly addictive drug widely used in the United States. 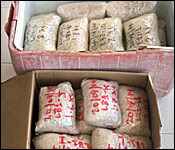 In many cases, the drug itself or, more often, the chemical precursors used to make it are trafficked through Belize, Guatemala and Mexico to the US. And last night, a stash with a value of more than 2 million US dollars was found in Orange Walk - and it happened, almost by chance. 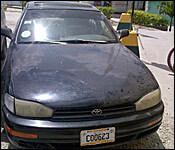 An unmarked anti drug unit vehicle was in the Louisiana area of Orange Walk Town when police observed a black Toyota Camry car driving erratically on the road, veering from one side to the other. The ADU pursued the vehicle to get the driver to pull over. But instead he sped up and headed towards the Northern Highway on Liberty Avenue. But the Toyota Camry spun out of control and that's when two passengers tried to flee on foot. Reports say the police fired at them, which is when the pair was apprehended. Inside the car police found a cooler with 18 parcels of Crystal Meth weighing 54.7 kilos, or 120 pounds. Belize police today said the value was 2 million US dollars, but internet documents we have seen from the Penssylvania Attorney General's Office says 120 pounds would have a street value of as much as 12 million US dollars. The driver was identified as 49-year-old RUPERTO EULALIO REYES of an Orange Walk resident and the passenger was 52-year-old PASCUAL TERRERO PINEDA, a Cuban of Boca Del Rio, San Pedro Town. Both have been arrested and are expected to be arraigned tomorrow. Tonight, the men who police caught with 120 pounds of Crystal Meth are in jail, after being arraigned in the Orange Walk Magistrate's Court. 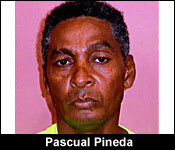 They are 49 year-old Belizean Ruperto Reyes from Orange Walk and 52 year-old Cuban Pascual Pineda from san Pedro. Police say that these men had at least 4 million Belize dollars' worth of the highly addictive drug in the back seat of the car they were in. They have since been charged with 1 count each of trafficking a class B drug, and they were arraigned after 4:00 this evening. Because of the seriousness of the drug they've been accused of trafficking, the case will be treated as indictable, and so no plea was taken. 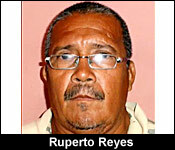 They've been remanded to the Belize Central Prison until September 30. As we told you, on Wednesday night at 7:20, the Anti Drug Unit lucked out when they were on patrol and saw a black Toyota Camry swerving form one side of the road to the other. The officers set chase after it, and on when the vehicle got near to Liberty Avenue, the driver lost control, and the vehicle spun out. Both men tried to flee, but the officers caught up with them. When the vehicle was searched, the officers found a red ice cooler which had 18 parcels of Crystal Meth to a total weight of 54.7 kilos - or 120.5 pounds. It is the largest Crystal Meth bust on record. The highly addictive drug is widely used in the US, which is where this cargo may have ultimately been destined for. Though Belizean law enforcement puts the street value of the drugs at 2 million dollars, documents we've seen from US authorities place a street value of 12 million US dollars on 120 pounds.